14 • April 2018 • S I G N & D I G I T A L G R A P H I C S ORAFOL Announces Wrap Certification Dates for 2018 ORAFOL Americas Inc. announces the 2018 dates for its wraps certification course. Combined with the ORAFOL Advanced Wrapping Academy, the course is designed to educate users about ORAFOL vehicle wrapping films, proper film selection, and application methods for difficult aspects of wrapping such as door handles, spoilers/air dams, and bumpers. The remaining 2018 dates are: • April 12-13 in Santa Margarita, California • June 14-15 in Indianapolis, Indiana • September 13-14 in Long Island, New York For more information and to register, go to http://bit.ly/2nNnnie. Matt Richart is co-owner of Louisville's Digital EFX and a Roland instructor. 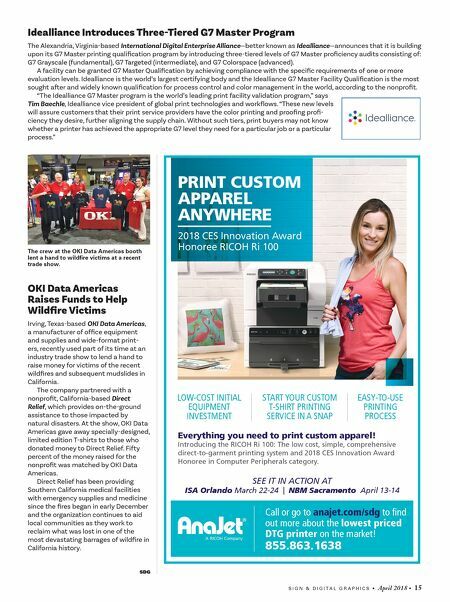 Roland Doubles the Number of 'Born to Wrap' Workshops Irvine, California-based Roland DGA, a manufacturer of wide- format printers, cutters and engraving devices, announces the 2018 schedule of its "Born to Wrap" workshops. 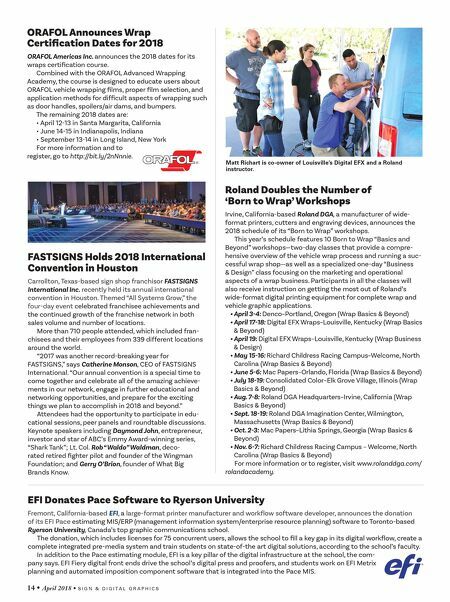 This year's schedule features 10 Born to Wrap "Basics and Beyond" workshops—two-day classes that provide a compre- hensive overview of the vehicle wrap process and running a suc- cessful wrap shop—as well as a specialized one-day "Business & Design" class focusing on the marketing and operational aspects of a wrap business. Participants in all the classes will also receive instruction on getting the most out of Roland's wide-format digital printing equipment for complete wrap and vehicle graphic applications. • April 3-4: Denco–Portland, Oregon (Wrap Basics & Beyond) • April 17-18: Digital EFX Wraps–Louisville, Kentucky (Wrap Basics & Beyond) • April 19: Digital EFX Wraps–Louisville, Kentucky (Wrap Business & Design) • May 15-16: Richard Childress Racing Campus–Welcome, North Carolina (Wrap Basics & Beyond) • June 5-6: Mac Papers–Orlando, Florida (Wrap Basics & Beyond) • July 18-19: Consolidated Color–Elk Grove Village, Illinois (Wrap Basics & Beyond) • Aug. 7-8: Roland DGA Headquarters–Irvine, California (Wrap Basics & Beyond) • Sept. 18-19: Roland DGA Imagination Center, Wilmington, Massachusetts (Wrap Basics & Beyond) • Oct. 2-3: Mac Papers–Lithia Springs, Georgia (Wrap Basics & Beyond) • Nov. 6-7: Richard Childress Racing Campus – Welcome, North Carolina (Wrap Basics & Beyond) For more information or to register, visit www.rolanddga.com/ rolandacademy. FASTSIGNS Holds 2018 International Convention in Houston Carrollton, Texas-based sign shop franchisor FASTSIGNS International Inc. recently held its annual international convention in Houston. Themed "All Systems Grow," the four-day event celebrated franchisee achievements and the continued growth of the franchise network in both sales volume and number of locations. More than 710 people attended, which included fran- chisees and their employees from 339 different locations around the world. "2017 was another record-breaking year for FASTSIGNS," says Catherine Monson, CEO of FASTSIGNS International. "Our annual convention is a special time to come together and celebrate all of the amazing achieve- ments in our network, engage in further educational and networking opportunities, and prepare for the exciting things we plan to accomplish in 2018 and beyond." Attendees had the opportunity to participate in edu- cational sessions, peer panels and roundtable discussions. Keynote speakers including Daymond John, entrepreneur, investor and star of ABC's Emmy Award-winning series, "Shark Tank"; Lt. Col. Rob "Waldo" Waldman, deco- rated retired fighter pilot and founder of the Wingman Foundation; and Gerry O'Brion, founder of What Big Brands Know. EFI Donates Pace Software to Ryerson University Fremont, California-based EFI, a large-format printer manufacturer and workflow software developer, announces the donation of its EFI Pace estimating MIS/ERP (management information system/enterprise resource planning) software to Toronto-based Ryerson University, Canada's top graphic communications school. The donation, which includes licenses for 75 concurrent users, allows the school to fill a key gap in its digital workflow, create a complete integrated pre-media system and train students on state-of-the art digital solutions, according to the school's faculty. In addition to the Pace estimating module, EFI is a key pillar of the digital infrastructure at the school, the com- pany says. EFI Fiery digital front ends drive the school's digital press and proofers, and students work on EFI Metrix planning and automated imposition component software that is integrated into the Pace MIS.